I’m thrilled to host another Dreamspinner author today, Anne Barwell! I brought you a little tease of her latest release last week, and here’s a little more. Her latest is a fantasy with everything you’d expect to find–magic, quests, dragons . . . and more to look forward to. One comment I’ve had about this book, apart from love for dragons, is “is this another series?” Umm yes. But in my defence, it wasn’t supposed to be. My plan was to write a fun fantasy one shot about dragons because I’d got this nagging little bunny after being asked what fairytale I’d like to rewrite. St George and the Dragon isn’t exactly a fairy story, per se, and you’d have to squint to see the resemblance to this story, but the thought is there, and it’s why Aric’s sister is called Georgia and there are dragons. The trouble with inviting characters in is that they then get comfortable and want to stay. I suspect it’s one of the reasons I can’t write one shots to save my life, and why this particular story is now a three book story. It wouldn’t have snuck in and queue jumped if I’d known it was going to do that as I still have other series I need to finish. I clung to the illusion that this was a one shot right to the end until it was shot down in flames by two of my beta readers. One told me the epilogue felt like it was the beginning of a new adventure for Aric and Denys, while the other agreed and then pointed out how it could be very easily two more books. Those books already have plots and titles: A Mage to Forget, and A Sword to Rule. The characters, of course, are extremely smug, that not only have they snuck in a series on me, but they’ve jumped up the queue to get them written. World War II first, and more vampires, and then they’ll get their shot. Sorry, Liam and Cal, (characters from a Psi Powers series I’m setting in Wellington), you’ll have to wait. 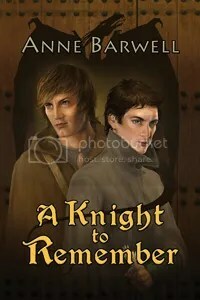 This entry was posted in Uncategorized and tagged Anne Barwell, Dreamspinner Press, Guest Author, MM Romance by Charley Descoteaux. Bookmark the permalink. I dearly love a good fantasy tale, but, Anne, does this mean we’re going to have to wait for the rest of your WW2 story cycle? Thanks for dropping by and commenting, Elin. Funny you should ask about WW2. I’ve just started writing ‘Winter Duet’ which is book 2 in that series, and the sequel to ‘Shadowboxing.’ I’m aiming to have it written and submitted by the end of February.